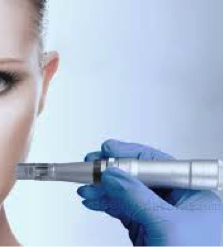 The Dermapen is a motorized surgical instrument that uses a disposable needle tip cartridge with 12 micro-needles. It also stimulates angiogenesis [the formation of new blood vessels]. As a reaction to the micro-wounds created, the body produces more collagen to repair the treated skin. The body will continue to produce collagen even after the punctures have completely subsided, to keep it healthy and glowing. Another natural mechanism of the body is to draw blood towards areas that need repair and sustenance. As the result of the holes (or micro-channels) made by this treatment, the skin will increase its demand for blood to heal the micro-wounds created prompting the body to send more. Platelets that are present in the blood will cause tiny clots and the microscopic scabs that will come after which will be naturally sloughed off in the process will reveal healthier new skin. The micro-punctures that the Dermapen creates are deep enough to reach the inner portions of the skin without causing heavy damage. Through these micro-channels, the skin is sure to soak up on the product quicker – and on a deeper, more beneficial layer – and be able to enjoy the healing effects even more.